I’m getting sick and tired of the fake news popping up just about everywhere. Personally, I feel manipulated every time I read a story on what’s happening in Washington. It happens on both the left and the right sides of the spectrum. No one is reporting the actual political story. Instead, it seems like every journalist is writing with the express intent to sway me towards their opinion of what is going on. It’s so frustrating! It’s sad, but I’ve grown to expect this from Washington correspondents. These days, I’m madder at the Wall Street reporters who have also let bias slip into their work. Their personal beefs with certain industries color their coverage. This means that most investors get mixed messages or even flat-out wrong information as reporters spin the facts out of Wall Street to their liking. But the good news is that if you look past the headlines and find out what is really going on, you can invest with good information and take advantage of some excellent opportunities. A Weak Month for Housing… REALLY? Last week, investors got a couple of “disappointing” reports on the U.S. housing market. On Wednesday, the National Association of Realtors reported existing home sales of 5.57 million for the month of December.1 This was below the 5.7 million economists were expecting, and the reports I read called this a “disappointing” reading. The very next day, the U.S. Census Bureau reported new home sales of 625,000.2 Once again, this number came in below expectations as economists thought there would have been 675,000 new homes sold. If you’ve been following our coverage of the housing market here at The Daily Edge, you might have been disappointed with the “weak” numbers. After all, I’ve been telling you for months that this is a great market for investing in real estate, and specifically in stocks of companies that build new homes. If fewer homes are being sold, that means the market is weak, right? You see, the actual details behind this data are much more positive than the headlines. But it takes a shrewd investor to understand why lower sales data actually leads to better profits from our home builder opportunities. Let’s think about why there may have been fewer home sales than expected. Is it because fewer buyers are willing to sign a mortgage and purchase their dream home? Or is it something else? If you look at the data, you’ll realize that the actual “problem” with the housing market right now is not that buyers are getting cold feet. 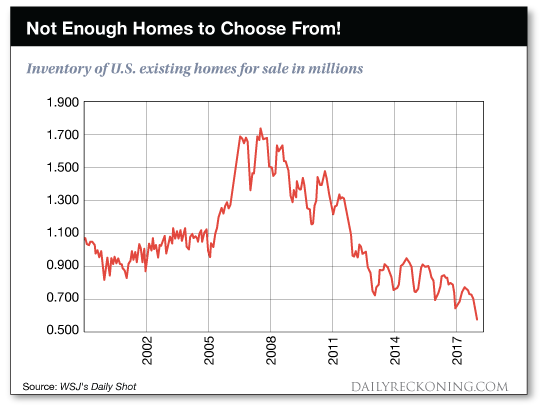 Instead, the problem is that there simply aren’t enough homes for buyers to choose from! According to the National Association of Realtors, the number of homes listed for sale has plummeted to the lowest level in decades!